The Delphi Bank Greek Film Festival has just announced its 2018 Program with a stellar line-up, celebrating 25 years of this popular and much anticipated annual event, which gives Sydneysiders the opportunity to catch some of the best films Greece has to offer! From the acclaimed Australian indie drama West of Sunshine to TV royalty in Jamaica, international award-winner Smuggling Hendrix and a retrospective full of laughs, The Delphi Bank 25th Greek Film Festival will again showcase the unique perspectives and talents of modern Greek storytellers. With 16 films including new offerings and old favourites, the Festival will screen from the 9th through to the 21st of October 2018 at Leichhardt’s Palace Norton Street Cinema and Palace Central Sydney, with tickets on sale today at greekfilmfestival.com.au. “We’re so pleased to celebrate 25 years of incredible Greek cinema,” says Festival Chair, Nia Karteris. “The talent in Greece is so rich and vibrant, and that’s really reflected in the quality of films we have in the program. There’s something in here for everyone—from the goofy, the dark, and the heart-wrenching,” adds Nia. From the award-winning Greek filmmaker Pantelis Voulgaris, the heart-rending drama The Last Note will open the Festival. Co-written by Voulgaris’ wife and acclaimed novelistIoanna Karystiani, the film recounts the lead-up to the mass execution of 200 Greek war prisoners in Chaidari concentration camp in retaliation to the ambush of four Nazi officers. Closing the Festival is Jamaica, the crowd-pleasing and touching directorial debut from TV director, Andreas Morfonios. Greek TV superstars Spiros Papadopoulos and Fanis Mouratidis star in the bittersweet comedy about two estranged brothers who are forced to reunite after a family tragedy. Jamaica (2017) – Taking the jump from the small screen, director Andreas Morfonios’ crowd-pleasing and touching directorial debut stars Greek TV royalty Spiros Papadopoulos and Fanis Mouratidis in a bittersweet comedy about two estranged brothers who are forced to reunite after a family tragedy. Polyxeni (2017) – Inspired by true events, Dora Masklavanou’s Polyxeni(writer Unfair World, GFF 2012) is an epic and engrossing exploration of trust, tragedy, and love set to the backdrop of Greek aristocracy in 1970s’. Rosemarie(2017) – Winner of Best Film at the 2017 Cyprus Film Days International Festival, Adonis Florides͛’ intelligently teeters between comedy and thriller in this telling of a burnt-out soap opera writer taking inspiration͛ from his neighbours. Smuggling Hendrix(2018) – Winner of Best International Feature at Tribeca Film Festival, and debut feature from Marios Piperides, this touching comedy-drama heroes one man’s unwavering commitment to his dog after it runs away and crosses the UN buffer zone. Success Story (2017) – With some of the biggest names in Greek cinema, including Konstandinos Markoulakis (The Telemachy) and Tonia Sotiropoulou (Skyfall), Nikos Perakis’ dark comedy chronicles conspiracy and betrayal as a passionate affair devolves into a toxic battle for dominance. The Bachelor 2 (2017) – The blockbuster comedy hit is a uniquely Hellenic take on The Hangover franchise, reuniting the cast of 2016 original for another night of madness and mayhem in Crete. 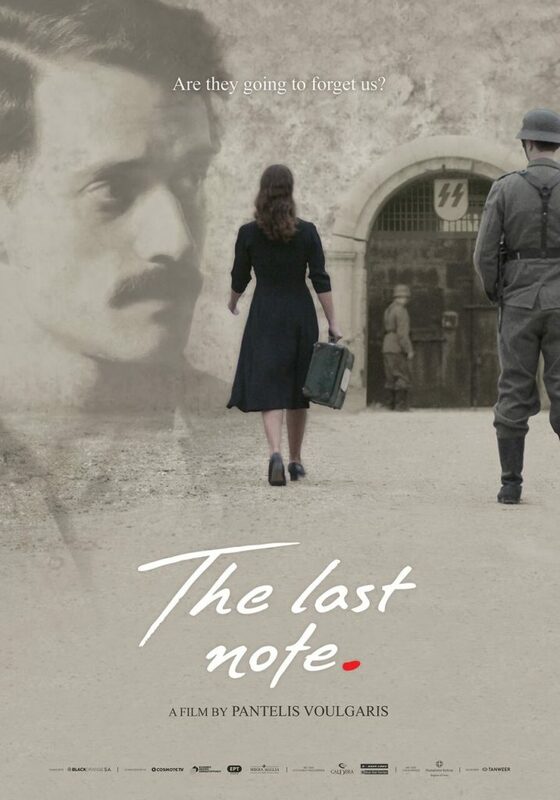 The Last Note (2017) -From the award-winning Greek filmmaker Pantelis Voulgaris, the heart-rending drama recounts the lead-up to the mass execution of 200 Greek war prisoners in Chaidari concentration camp in retaliation to the ambush of four Nazi officers. From the anti-establishment jibes of Nikos Perakis to mob bosses and human cloning, the curated LOL @ GFFRetrospective program samples the breadth of humour that keeps Greeks smiling even when faced with hardship. Prepare to laugh so hard you’ll cry! First Time Godfather (2007) – Based on an autobiographical short story by Nikos Papandreou, son of a former Greek prime minister, this uproarious tale dives into Greek culture with the same unbridled humour as My Big Fat GreekWedding but with extra realism. I Love Karditsa (2010) – Cloning, millions in missing organised crime money and a couple of hit men on a mission combine to create this anarchic comedy farce from celebrated Greek filmmaker Stratos Markidis. Kiss of Life(2007) – A chance encounter on the way to his wedding destroys the best-laid plans of a bored, thirty-something groom in this side-splitting romantic comedy loaded with amusing mishaps and endless intrigue. Loafing and Camouflage (1984) – Heralded as a cult-classic and perhaps the best Greek film ever made, this semi-autobiographical film from Nikos Perakis is a satirical Catch 22-esque take on his time in Greek military service. Nisos (2009) – After a sudden death, an island’s richest man reveals himself like a mischievous troublemaker from beyond the grave, with scandalous affairs, unsolved crimes, hidden double lives disclosed one-by-one. Sirens in the Aegean (2005) – The biting and sardonic follow-up to Perakis’ Loafing and Camouflage(also screening at GFF 2018), the comedy classic attracted an audience of over 1.5 million viewers, placing it (at that time) behind only James Cameron’s history-making Titanic in terms of popularity. The Delphi Bank 25th Greek Film Festival runs 9 – 21 October 2018 at Palace Norton Street and Palace Central Sydney, and also travels to Melbourne, Adelaide, Canberra, Brisbane, and Perth!